Description: 1/2 Kneel Hip Flexor Stretches are obviously a stretch that targets your hip flexors which are easily subject o tightening. Given the most popular posture for adults is sitting, it's very common for golfers to have tight hip flexors. This can have a significant affect on your posture, back strength, back pain/comfort level, knee pain/comfort level just to name a few. This exercise helps to create more freedom of movement and awareness of lumbar posture and pelvic control. 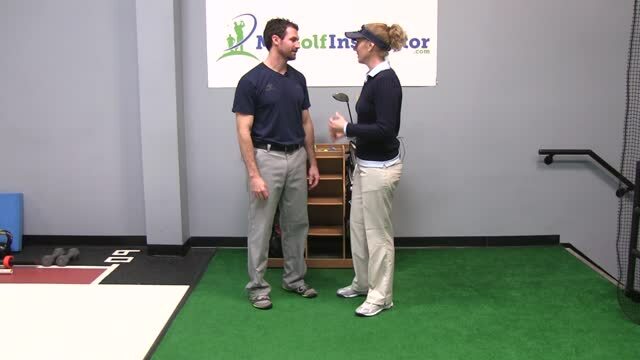 These benefits help improve your golf posture and pivot. Start by getting down on one knee. Let's start with the right knee. Make sure that your rear thigh (right) and front shin and foot (left) are all pointed straight ahead. Place your left hand on your left thigh and your right hand on your right hip for stability. Next, bend your left knee. Notice that your calf will come in contact with your hamstring muscle. Make sure to keep your back completely straight. You should feel the stretch now in your right hip flexor. Begin by performing 5-6 repetitions on each side holding for 20-30 seconds. If this is an area you really need to target you could add a couple more sets of 5-6 reps.